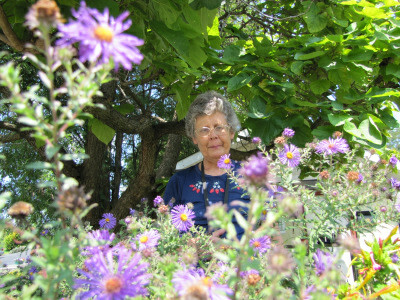 I've had tansy ever since my mother brought a start to me from South Weymouth, Massachusetts, probably from her own yard, and probably, too, originally from her sister, Ruth Tirrell. My mother would have little sprigs of the tansy flower mixed in with barberry bush sprigs, in a vase on her windowsill over the sink. These little "button" seedheads stay yellow for ages, and keep their bitter, aromatic smell even longer. The reason for tansy was to keep ants away. In my mother's kitchen this never seemed to work! But I guess she kept tansy as a comforting decoration, anyway! I've looked up a tansy cookie recipe, in the Rodales Herb Book, ed. by Williamk Huilton, 1974: Beat 1/2 c. honey and 1/2 c. butter. Add 1 egg, then 2 c. whole wheat flour, 1/4 tsp. baking soda, 1/4 tsp. salt, 1 tsp.vanilla and 1 1/2 tsp. tansy (probably dried leaves), plus 1 tbsp. yoghurt. Roll out to 1/8 in. thick, cut into rounds, sprinkle with more tansy and bake at 375 for 10 min. Because it is a "bitter herb" the cookies were eaten at Easter, and the dried leaves were eaten at Passover. The seeds can be eaten as a worm expellent. There are other medicinal uses, of the tea brewed from the leaves: for eye imflammtion and styes, and in compresses for varicose veins! 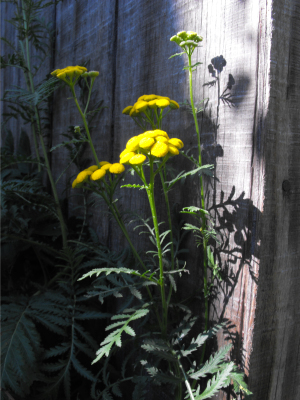 Tansy is supposed to deter mosquitoes, and squash bugs, besides ants. Some say it therefore attracts aphids. Some say it deters cucumber beetles, some say it attracts them. I have my tansy tangled up with a volunteer blackberry vine, and have never had Japanese beetles there. Some others plant tansy under fruit trees. This is a ferny perennial that is started best from small starts, not seeds. Mine has grown to 6 feet, taller than the usual 4. Worth growing for its distinctive smell and flowers. Find the time to follow your dreams with Microbusiness Independence. You should have seen the look on my dad`s face when I mentioned that you folks are growing tansy for pleasure. In some ways I can understand since it has begun to over-run our farm over the last 20 years. Jerry --- I'm not too surprised --- so many things we grow turn invasive somewhere. I'm curious to hear where you live. Luckily, Mom shouldn't have any trouble in her little city backyard. Jayne --- Thanks so much for the positive feedback! Mom's got a lot of great information to share, and I hope to tease several more lunchtime series out of her. The essential oils from this plant are approximately 77% thujone, which is quite toxic. Between 5-10 mg/kg causes convulsions in rats and mice (and presumably humans), and a dose between 200-500 mg/kg is the LD₅₀ in rats. That doesn't sound good! On the other hand, I suspect that you wouldn't get anywhere near a toxic dose with a teaspoon and a half of dried leaves. After all, the leaves must be a very small percentage essential oils, and I'm estimating that a small person would get about 3.5 mg/kg of the total plant if they ate the whole batch of cookies! I'm sure you could give people similar warnings about overdosing on other foods --- I remember when I was a kid and read that eating too many carrots gave you cancer. I wonder if the tansy does something beneficial in small amounts, the way coffee and wine are supposed to? Thujone was supposed to be the the active ingredient in absinthe responsible for its reported psychedelic effects which was therefore banned for a time. But modern analysis of pre-ban bottles has shown relateviely low doses compared to the amount of alcohol it contains. Abinsthe would probably give you alcohol poisoning long before you'd get a dangerous dose of thujone. The only documented cases of thujone poisoning are from consuming essential oils containing it, hence my warning. I think that would be the only way to ingest harmful quantities. Of course such essential oils also contains a hodgepodge or other chemicals that may or may not have toxic effects. I'd guess that cookies containing dried leaves will probably contain very little thujone, since it boils at 201 °C (394 °F). There are a lot of chemicals can be beneficial or at least harmless in small quantities and toxic in large quantities (ethanol and paracetamol being good examples). Thujone is simply one of them. Very good point about the thujone's boiling point --- I guess I don't have to tear any tansy cookies out of my mom's mouth now.